Holiday Table for Eight! Minus Four? Thank you for your visits and, to so many of my favorite blogging friends, for the thoughtful comments you left for me last week. As promised, here's a look at the table I set for a holiday dinner party. I used Lenox Holiday salad plates. The dinner plates are Lenox Hayworth. The glass chargers are a Goodwill find. I starched and ironed the hemstitched linen napkins and added a simple, silvery napkin ring. The fireplace adds cozy warmth. The "tablescape" table is set for 8, but there will only be 4 for dinner. The first order of business is pouring out the faux (colored water) wine, rinsing, and drying the glasses. 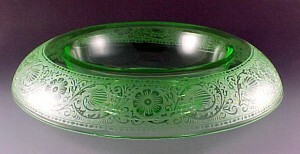 They're Fostoria Holly (1942-80), one of my favorite stemware patterns. The stylized laurel band is a combination of etching and cutting and, while I use them throughout the year, the holly motif seems particularly appropriate for the holiday season. Simple quilted placemats allow the wood of the tabletop to remain visible, while adding softness and cushioning (and quieting movements of) the plates and silverware. I replaced the napkins with green restaurant-style ones in a "wash and wear" cotton blend. As I mentioned in the last post, the centerpiece consists of a pine cone wreath, magnolia cuttings, and a thrifted glass candleholder. A closer view of the plates, charger, and placemat. Holly champagne/tall sherbets make attractive stemmed tealight holders. I filled the glasses first with rock salt to protect them from heat and provide the look of wintry crystals. I removed the candles from their metal cups for a cleaner look. After dinner, I lifted out the melted candles, leaving most of the salt ready to be used again. I hope you enjoyed your visit. Here's wishing you all a very Happy New Year!!! 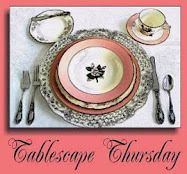 Please visit Susan of Between Naps on the Porch for Tablescape Thursdays. She and her talented guests always provide warm hospitality and great creative inspiration! 'Tis the night before Christmas Eve! 'Tis the night before Christmas Eve! And it's been a long time since I've done a new post. I thought of putting the blog to bed and saying it's been a good run, but I think I'd miss blogging. 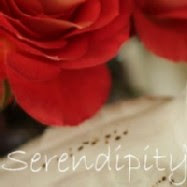 I know I'd miss the sweet friends I've made in Blogland. I appreciate all of you more than you know. After a busy day of cooking, wrapping gifts, and dropping off food and flowers for neighbors and friends, I decided to share a few pictures of this year's Christmas decorations. There's so little that's different from last year's efforts that I almost crossed it off my "to do" list (by that I mean posting about it -- not the decorating itself!). If you've visited Affordable Accoutrements before, you know I love entertaining family and friends. I'm glad you're here! It's a gloomy day, and it's been raining. But it's warm inside -- come on in, OK? I made a magnolia wreath for the front door again, using leaves from a neighbor's tree (some of the branches extend over the back fence, so no trespassing was required!). It took about thirty minutes to hot glue the leaves to an inexpensive (old and battered) artificial greenery wreath. Maybe next year, I'll do a more painstaking job. But probably not. Perfection can be boring, don't you think? The garland on the staircase is artificial, but I inserted greenery clippings here and there to create a more realistic illusion. The clippings were free at Lowe's! I attached the garland to the railing with plastic-coated wire and covered the wire with drapery tie-backs with tassels. If you look closely, it's easy to see that it's not real, but at a glance (particularly in the evening when the lighting is softer), I think the overall effect can be appealing. Candles always enhance the mood, and mirrors can be an asset in maximizing the effect (as they were in the days before electrical lighting). The double-light candleholders are vintage Fostoria in the Holly pattern. The tall single ones were a Goodwill find. I wired some inexpensive glittered ornaments to the garland in the den to create extra sparkle. This year's tree is a much smaller one than the one from 2011. It goes up faster and requires far fewer decorations. It also interferes less with traffic flow in the room. My favorite new/old ornaments are the mid-century blown glass teardrop ones. They were still in their original box from Sears. I think I paid $1 for 5. I noticed a few bare spots on the tree after I'd put away the decorations. Drapery tie-backs to the rescue again! I love repurposing, don't you? A thrifted glass candleholder in the middle and Voilà -- instant centerpiece! Come back next week, and I'll try to have two versions for you to see: a fantasy table for 8 and the scaled-back version of the real dinner party for 4.